I'm just getting started in high-speed photography. What kinds of triggers do you recommend? Can I trigger my camera's electronic shutter with a photogate or other trigger? My flash doesn't have a PC cord. How do I connect it to the trigger? Can I trigger a Pocket Wizard or other wireless controller with a HiViz.com circuit? I have an old flash unit that has high voltage across its terminals. Will this damage the HiViz.com trigger or delay circuits? Do HiViz.com circuits output a voltage that can hurt my flash unit or camera? I'm using a flash unit that requires a voltage pulse of 5 - 10 V to trigger. Can I use a HiViz.com trigger or delay circuit for this? Can I use an AC to 9-V DC adapter to power a trigger circuit? When using a HiViz.com delay circuit to trigger my Canon 430ex or 580ex flash, the flash unit is disabled after each discharge until I turn the unit off and on again. What can I do? When using a HiViz.com delay circuit to trigger my camera shutter, the camera is disabled after each discharge until I camera off and on again. What can I do? My HiViz.com delay circuit won't trigger my camera shutter. What can I do? How do I get a trigger circuit to discharge a Nikon SB-600 flash? When I use a trigger circuit to actuate the shutter on my camera, the image doesn't display in the LCD until I disconnect the trigger circuit. What can I do? Can I trigger two or more flash units simultaneously from one output of a trigger circuit? I'm having trouble triggering my Sigma EF-500DG Super flash from a trigger circuit. What can I do? 1. I'm just getting started in high-speed photography. What kinds of triggers do you recommend? A sound trigger, photogate, and delay unit cover many situations. The SPG1 style photogate provides for flexible positioning of the emitter and detector. You can also replace the infrared LED with a red laser pointer in order to operate the photogate over large distances. A delay unit is often used with a photogate. If, for example, you want to photograph splashes, you need to delay the discharge of the flash from when the drop passes through the photogate until it reaches the water's surface. When using the sound trigger, delays are usually set according to the distance from the source of the sound to the microphone. Figure a delay of about a thousandth of a second per foot (30 cm) of distance. If you need particularly long delays, then it becomes convenient to use a delay unit. You can use the same delay unit as for the photogate. The delay unit can also be used with a contact trigger. See this page about contact triggers. You would simply connect the two wires from the contact trigger to the input and the ground of the delay unit. 2. Can I trigger my camera's electronic shutter with a photogate or other trigger? This is a useful thing to be able to do if you're, say, photographing insects, birds, or other unpredictable subjects. You simply can't hold the shutter open waiting for the subject to do its thing. Our triggers and delay unit will trigger either flash units or camera shutters that have electronic shutter cables. If you're doing this yourself, you'll need to cut your remote shutter cable in order to splice it to the trigger or delay unit output. The remote cables usually have 3 wires. Shorting 2 of them together performs the autofocus and exposure operations of the camera. Shorting the 3rd wire to the other two closes the shutter. You would use the output of the trigger or delay unit to perform the latter function. Some cameras have shutter cables designed especially for DIY projects. An example is the Nikon MC-22 remote cord which works with the Nikon D series cameras with the exception of certain models (see below). The cable ends of the MC-22 are blue, black, and yellow. Shorting the blue and black ends together does the autofocusing and exposure operations. Shorting the yellow cable to the other two actuates the shutter. See this link for more information about making your own shutter release cable. If you prefer to work from a kit to prepare an adapter cable, see this link. Cameras with infrared remotes such as the D70/70s aren't well-adapted for use with our triggers. While you might be able to wire a trigger directly to the remote, the shutter lag may be unacceptable for high-speed applications. See this link for a discussion. 3. My flash doesn't have a PC cord. How do I connect it to the trigger? Not a problem. Adapter shoes are available that have a PC cord. A photo and description are given here. If you need a PC cord specifically for a Vivitar 283, search for Vivitar PC-1 on the website of your favorite photographic supplier. Some suppliers are listed in the answer to the next question. 4. Can I trigger a wireless controller such as a PocketWizard with a HiViz.com circuit? Definitely. Most wireless controllers are actuated by a simple short circuit. That's the output that HiViz.com circuits provide. 5. I have an old flash unit that has high voltage across its terminals. Will this damage the HiViz.com trigger or delay circuits? No and yes. The trigger and delay circuits use SCR outputs that are designed to withstand 400 V across the outputs. So you wouldn't hurt the SCRs. On the other hand, if you connect such a flash unit to the direct output of a photogate or sound trigger and you also have the output connected to the input of the delay unit, you'll burn out the 556 timer. So be sure to disconnect the trigger from the input of the delay unit first. 6. Do HiViz.com circuits output a voltage that can hurt my flash unit or camera? When connections are made according to this chart, the output is a short circuit. This can be used to trigger most flash units. When connections are made according to this chart, there is a voltage output a little under 9 V. This can be used to actuate an optoisolator (such as the Opto-Switch) or a flash unit that requires a low-voltage trigger pulse. Cameras should not be connected directly to the low-voltage outputs. 7. I'm using a flash unit that requires a voltage pulse of 5 - 10 V to trigger. Can I use a HiViz.com trigger or delay circuit for this? Yes, with modification. Connect a voltage source of 5-10 V in series with the output of the trigger or delay circuit and your flash unit. After each triggering, you may need to open the output circuit and then close it again in order to effect a reset. The diagram below shows the connections for a 9-V trigger pulse. 8. Can I use an AC to 9-V DC adapter to power a trigger circuit? This works fine. Use an adapter with a 9-V DC output at up to an ampere of current. 9. When using a HiViz.com delay circuit to trigger my Canon 430ex or 580ex flash, the flash unit is disabled after each discharge until I turn the unit off and on again. What can I do? Versions of our kits prior to v10 used the 22-kΩ resistors shown in this photo. If this is what you're using, try replacing the 22-kΩ resistors with 1-kΩ resistors. 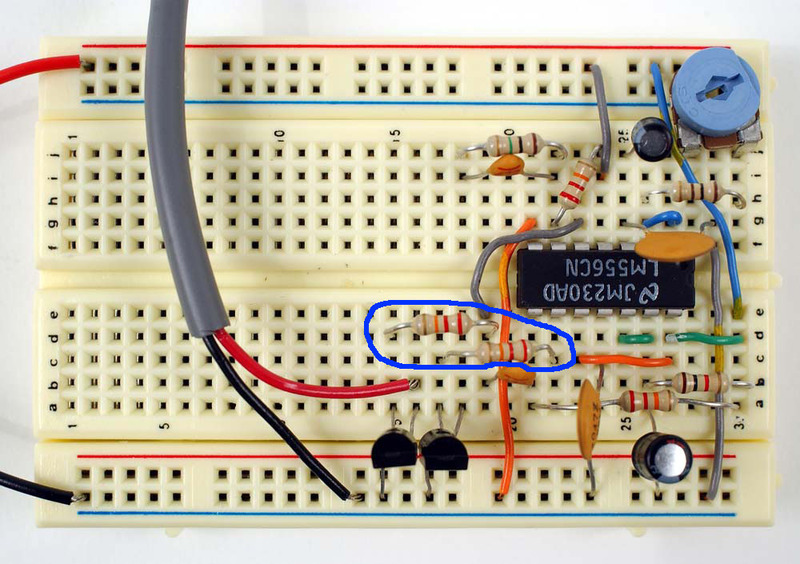 Or try this method reported by Brad Steel: Connect a 4.7k resistor in between the delay SCR output and the flash wire. We think this has the effect of limiting residual current in the Canon trigger circuit that would otherwise keep the SCR closed. 10. When using a HiViz.com delay circuit to trigger my camera shutter, the camera is disabled after each discharge until I turn the camera off and on again. What can I do? Try replacing the SCR with an NPN transistor such as a 2N2222, or use a Camera Opto-Switch. 11. My HiViz.com delay circuit won't trigger my camera shutter. What can I do? 12. How do I get a trigger circuit to discharge a Nikon SB-600 flash? First put the SB-600 in manual mode. Then you'll need a way to attach the SB-600 to the trigger circuit output. See the following link for a way to do that. Thanks to Tom Denham for the information above. 13. When I use a trigger circuit to actuate the shutter on my camera, the image doesn't display in the LCD until I disconnect the trigger circuit. What can I do? This happens because the output of the trigger circuit latches closed until it's reset. Try connecting a normally-closed pushbutton (available from Radio Shack) in one of the wires that you connect to your camera shutter. After each shot, push the button momentarily to reset the circuit. This should also allow the LCD to display. 14. Can I trigger two or more flash units simultaneously from one output of a trigger circuit? Yes, this is possible with some flash units. One method is to connect the flash units in parallel across the output. We've used this method with as many as 10 Vivitar 283s. This works best if using all the same make/model of flash. It's not recommended if using different flash units, and it's possible that it won't work for some models. And here's something to be especially careful of. There are two different version of Vivitar 283s; the older version has ~300 V across the flash terminals. Connect one of these in parallel with a neter version that has ~10 V and you could have problems. Another method which gets around the possibilty of one flash's trigger circuit affecting anothers is to use wireless transmitters and receivers, such as PocketWizards. Connect a transmitter to the output of the trigger circuit. Then put receivers on the flashes that you want to discharge simultaneously. A disadvantage of wireless transmitters is that they tend to have a lag of a millisecond more. That may not sound like much, but it makes a big difference for events suchs as balloon bursts. In that case, optical slaves are superior. This light-activated trigger makes a nice slave. 15. I'm having trouble triggering my Sigma EF-500DG Super flash using a hot shoe cable connected to a trigger circuit. What can I do? Try putting your flash unit in optical slave mode. The same may apply to the 530DG.